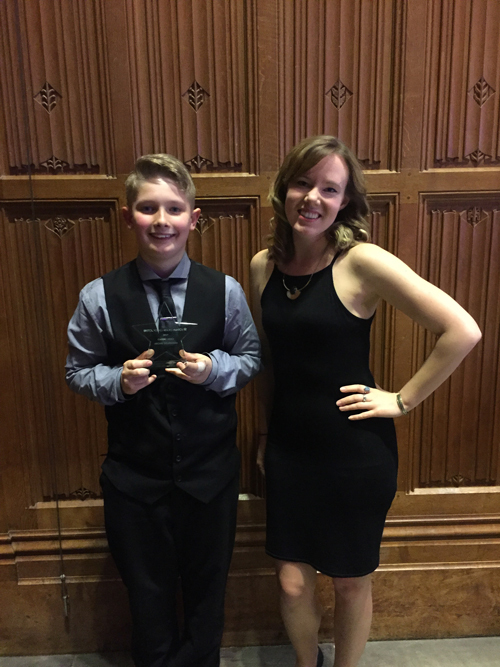 Year 7 Fairfield High School (FHS) student, Archie Drummond, has won the Caring Hero award at the Bristol Young Heroes Awards. This ceremony, held on March 31 at the Wills Memorial Building in central Bristol, saw a number of famous faces in attendance, including Olympic gymnast Claudia Fragapane, international DJ Roni Size, singer Beth Rowley and Hollywood actor Liam Garrigan. Archie was nominated by his tutor Miss Thompson after she learnt about the number of acts of kindness towards other students, coupled with his dedication and caring role he plays at home for his brother, Dexter who has autism. At the beginning of his time at FHS, Archie ensured that a student with special educational needs was given priority on a bus home by asking the other Year 11 students waiting to let him have a seat first. Archie also made sure a Year 9 student with autism was looked after in the playground and did not hesitate to show him support in front of other students. It was only at this stage when Miss Thompson phoned home to share these positive stories that Archie’s home life came to light. His Mum told about the poor health of Archie’s step father, which has resulted in Archie taking a key role in the upbringing and care of his 5 year old brother. Miss Thompson then promptly entered Archie for the Caring Hero award. After being narrowed down to three finalists in this category, Archie was declared the winner, with the award being presented by Marvin Rees, Mayor of Bristol.